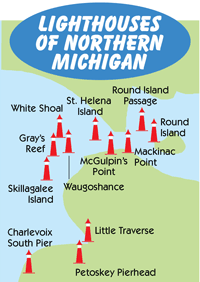 Ludington is known for many things...but visitors flock to the area to view our two iconic lighthouses, the North Breakwater Light and Big Sable Point Lighthouse. Once used primarily as a way to guide ships into port, these are now historic structures that are beautiful backdrops to our Lake Michigan shoreline. Both lights are owned and maintained by the Sable Point Lighthouse Keepers Association, and volunteers staff the lights during the busy summer season. There is a $5 donation fee for adults to tour the lights, $2 for children. 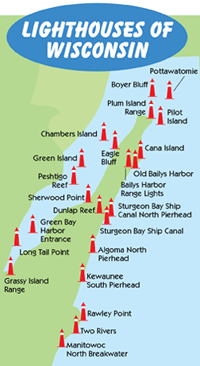 If you are within 200 yards of any Michigan lighthouse you can activate the foghorn. Just turn your marine radio to channel 79, then click five times in rapid succession. 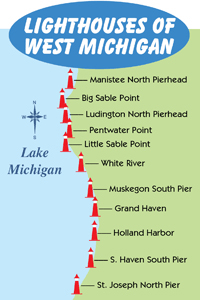 Located at Stearns Park Beach, it is ranked as the #1 Michigan lighthouse to visit, and it's a great place to watch the sunset or wave at the S.S. Badger carferry as it cruises out onto Lake Michigan. The breakwall leading out to the light is a popular venue for fishermen and those who enjoy walking the mile-long round trip. Originally built in 1871 and replaced in 1924, the light shines across nearly 20 miles of water, and its familiar horn warns boaters of impending bad weather. 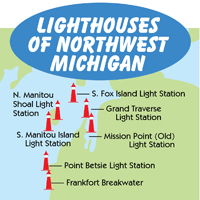 The North Breakwater Light is open in the summer for tours Monday through Sunday from 10am-5pm. While at Stearns Park, enjoy the Skate Park, mini-golf, playground, shaded picnic area, and concessions. Read our story about Ludington's North Breakwater Light for more photos and information. This lighthouse stands proudly at the tip that juts out into Lake Michigan within the Ludington State Park. The black-and-white striped tower is listed on both the state and national registers of historic places. You can tour the lighthouse daily from 10am-5pm from early May to late October, or visit the gift shop that is located in the original keeper's quarters. The Ludington State Park was named the #1 state park in the Midwest and offers camping, hiking and biking trails, a dam, two beaches, and seasonal programs. Tube down the Sable River or take a relaxing canoe ride along the shoreline. The wildlife and natural habitat at the park are spectacular, and even when there are thousands of visitors...you can find a quiet trail to escape the crowds. Read our story about Big Sable Point Lighthouse for more photos and information. Ludington Lighthouses & Stunning Sunsets! One of the best times to visit the lighthouses may be in the evening. We have some of the most gorgeous sunsets you'll find anywhere. In fact, many people make sure they're down at the beach to witness the golden orb sink into Lake Michigan. Check for the sunset times by viewing the sunset schedule. Young or old--don't miss out on these two famous Ludington landmarks.